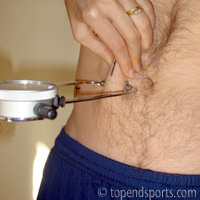 The abdominal skinfold site is one of the common locations used for the assessment of body fat using skinfold calipers. See the complete list of skinfold sites, and the general procedure for taking skinfold measurements. 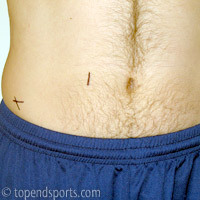 a mark is made 5 cm adjacent to the umbilicus (belly-button), to the right side. See notes below about alternate sites. The vertical pinch is made at the marked site, and the calipers placed just below the pinch. Be careful not to place the caliper or fingers inside the navel. Variations of this measurement site has the measurement taken 1 cm, 2 cm and 1 inch to the right side of the umbilicus. Another is 3 cm lateral to the midpoint of the umbilicus and 1 cm inferior to it. Also note that the skinfold is sometimes taken with a horizontal fold. This site is also occasionally known as the paraumbilical skinfold site. Do you have an innee or an outee?